The project set out to research the portraits at Dyrham Park, looking at the collection of 112 works purchased by William Blathwayt from his uncle Thomas Povey in 1693. The aim was to consider the relationships Blathwayt sought to articulate through Povey’s portraiture, to investigate for what purpose Blathwayt bought the portraits in the collection, and how they delivered his aims. Part of this research process was to consider the identity of individuals represented in the collection, why they were included, and reasons for their continuation or loss from the Blathwayt collection. Preliminary findings have been made, as a ground for future research, for the project is too large to have been completed in the timeframe. It would seem that many of Thomas Povey’s non-familial, royal or fictional portraiture, as purchased by Blathwayt, was of individuals with theatrical or artistic associations. This is an understanding either unknown or not hitherto articulated at Dyrham. It has become immediately apparent that accessing Blathwayt’s motivations is very difficult, for we have so little documentary evidence for how his pictures were hung, or on the nature of his domestic life. Further, to consider Blathwayt, we must first consider why Povey acquired these pictures in the first place, only then will Blathwayt’s motivations be seen in context. Of those individuals named, but now lost from the collection, Ben Johnson was the famed dramatist, Mr Sheldon probably the builder of the eponymous theatre in Oxford, and Lady Swann, the married name for Utricia Ogle, an “accomplished instrumentalist, with a lovely singing voice” (Jardine, L 2008, p.163. Going Dutch. London). 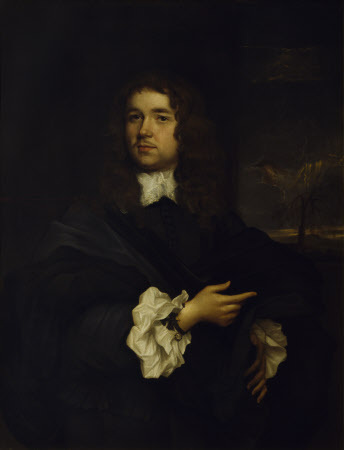 Thomas Killigrew, another great dramatist, is still to be seen at Dyrham, as is Henry Wriothesley, 3rd Earl of Southampton, the patron of Shakespeare. The research data was intended to be used to provide additional information for the catalogue of Dyrham pictures. It was to provide further understandings for use in any future re-presentation of Dyrham’s showrooms, and it was to provide material for improved paintings interpretation. The primary aim was to share these understandings imaginatively with our visitors. Further research is continuing on this area, and in due course the evidence will be integrated into the National Trust’s collections management system. Further, I and a colleague are continuing this research question and intend to publish an article in 2011.